Needless to say, we were concerned about Loki’s excessive fear, so at the advice of a dog trainer, we sat with him in front of public places and asked strangers to give him dog treats we provided. This resulted in more than a few awkward conversations with store managers where we had to explain that no, we weren’t panhandling – we were just trying to socialize our puppy. This did help Loki, by the way. He stopped seeing new people as potential threats, but in a variety of ways, he showed that he still had anxiety issues. I’m not going to list all the remedies we tried over the next four years because that would take too long. Suffice it to say that if you’ve heard of it, we probably tried it. We took him to different doctors and specialists in two different states. His final diagnosis, after ruling out LOTS of things, was that he has chronic anxiety from a probable biochemical imbalance. He’s now on medication that greatly reduces his anxiety. His hair is no longer patchy (yes, his hair had been literally falling out in paces, poor guy) and he no longer jumps at every sound. He does, however, have a remaining distinctive trait – he only likes to come out at night. Don’t get me wrong; Loki loves to go on walks, and to state the obvious, there is sunshine outside. However, he has a marked dislike of being out and about in our house during the day. Seriously. 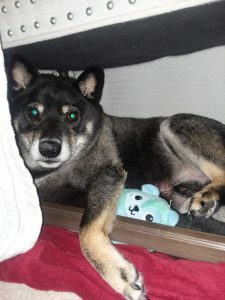 He will spend most of the day in his favorite covered cubby (see pic after I’ve lifted the blanket up) coming out only to eat, get a quick walk, get a scratch, or briefly play. But as soon as the sun goes down, Loki comes out and STAYS out. No, he doesn’t have an eye sensitivity or other optical condition (remember all the vet visits I mentioned?) He just far, far prefers the night. *grins* Maybe I should have named him Vlad instead of Loki. 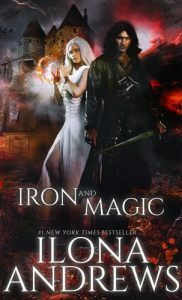 I have Iron and Magic on order, I can’t wait to read it. Your dogs are adorable. Please tell me what breed or mix of breeds Gypsy is. Is she fully grown in that picture? 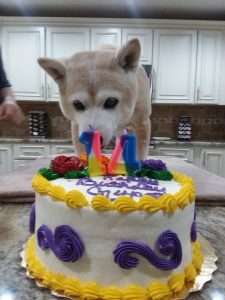 Yes, Gypsy is 14 in that picture. She’s normally furrier (think an Akita) but we shave them because we’re in Florida and it’s HOT. Blessings for your dog (s). Some characters they are. And thanks for you rec. I’ve read all the last ones you posted and was never disappointed. I just startet last weekend to reread no let me correct relisten to all the night Huntress books. First I thought I should only listen to the last ones (Vlad) but after I finished…I decided to start at the beginning. So now I am at this side of the grave and damn I startet much too soon. But I couldn’t resist and wanted to listen with more concentration on Ian .should have waited till october. Anyway after my withdrawl I will start with Iron and magic. Happy re-reading, and I hope you love Iron and Magic as much as I did! 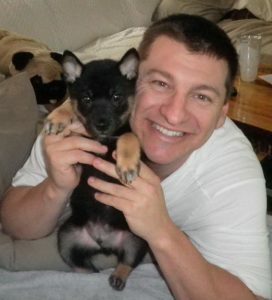 Loki is so lucky to have you two for pet parents. Not many people would go to the trouble and expense to search for a diagnosis. I’m glad for all concerned he is better. I’m reading Iron and Magic now. I’m forcing myself to go slow so it will last. I’ve hated Hugh for several books now, but I never doubted I would follow like a good little reader to where ever Ilona led me. And…it’s happening. I don’t know how complete this transformation will be, but I don’t doubt it. I hope there won’t be a similar situation with Roland. He’s horrible and deserves the worst. Sigh. I’m still in the first half of the book, but I can already say, regardless of what happens, I’m THRILLED this is a trilogy. Who knows, it might go beyond that! I can’t wait to talk to you about Iron & Magic when you’re finished! SUCH a great book!